View More In Ice Cream & Novelties - Page 2. Simply mix with cold water and pour into your soft serve machine. Read on for specific mixing details. 1. Fill clean bucket with cool water to the one gallon line. 2. 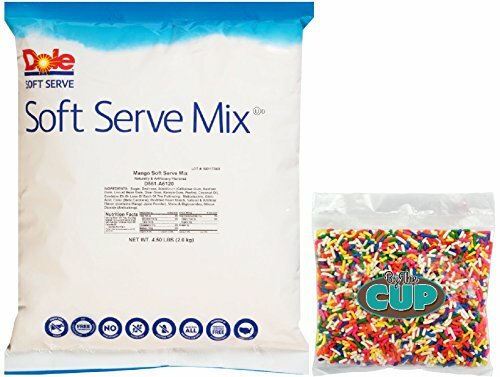 Pour in one bag of DOLE Soft Serve Mix while stirring. 3. Add water to bring the mixture to the two gallon line. Stir mixture. 4. Pour mixture into soft serve machine OR cover bucket with lid and put in refrigerator. (41 F within four hours and remain at or below 41F). If you have any questions about this product by By The Cup, contact us by completing and submitting the form below. If you are looking for a specif part number, please include it with your message. Sanders Fine Chocolate Caramel Dip Cups, 24 ct.